Related: Installing Headlight and Taillight Modulators on your 3rd gen Magna! Note: This article was originally posted to this website around February, 2015. The above post date of this article reflects when it was added back after a major update to this website. After deciding to replace the original incandescent bulbs on my Magna gauges with LEDs, I first had a look at the parts list to determine what kind of bulbs I was dealing with. This was when I (as well as many others from what I can tell) discovered that apparently the tachometer contained mystery bulbs. That is, everywhere I looked on the web, they were only listed as “Bulb 12v 1.4w”. See for yourself (part 3). I did some more searching and found forum posts with people talking about this mystery bulb, and talking about replacing their stock bulbs with LEDs, but surprisingly, nobody seemed to know what types of bulbs were in the tach. Even in posts as recent as a couple months before this writing. So, screwdriver in hand, I decided to figure this out once and for all. It turns out the mystery bulbs in the tachometer are T6.5 1.4w bulbs. They are the same base type (T6.5) as the 3W bulbs used for the “idiot lights” (oil, temp, sidestand, etc) which are part number 001 in the parts list linked above. 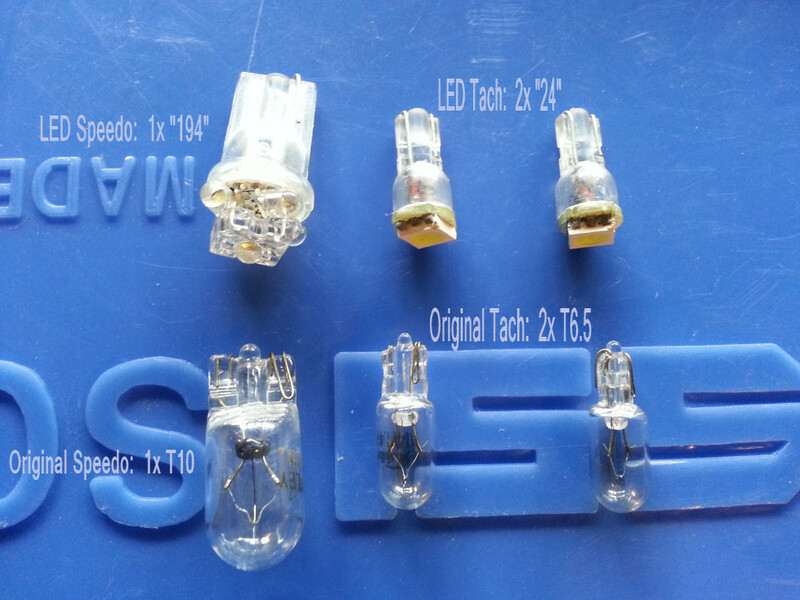 Anyway, my next step was to find LED equivalents of these bulbs. After some quick searching, I decided on SuperBrightLEDs.com. They seemed to have a good selection, decent prices, and I had seen other mentions of their site in my searches. Here is your shopping list from there. Read on for my reasoning on the bulbs I chose. There are several LED lights to choose from for the speedometer (originally a T10 wedge base incandescent which is equivalent to a “194” wedge base size) but only one equivalent to the T6.5 wedge base, which is the “24” wedge base size. 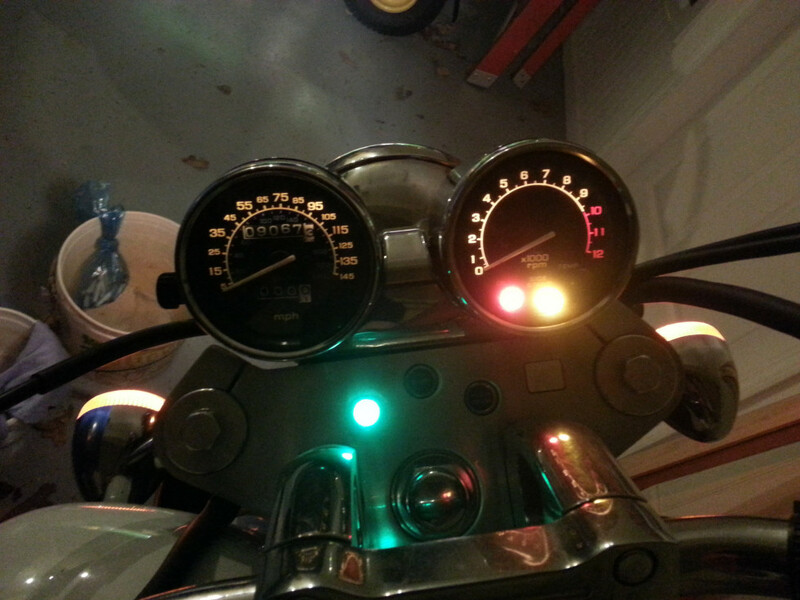 For that reason, I chose the 24-WHP LED bulb for the tachometer since it was the only one that I was sure would fit. Incidentally, if you also want to replace all of your “idiot lights” with LEDs, that is your only choice. I decided to leave those alone on my Magna because I felt they were already plenty bright anyway. I won’t go into too much detail, but for the speedometer, I chose the WLED-CW5. In short, the reason was because of all of the “194” LED bulbs they had, that one seemed to be the closest equivalent to two 24-WHPs in terms of lumens and also it had a pretty wide beam pattern. I wanted something close to the same lumens because I was afraid that if I got a “194” speedo bulb that had a considerably higher lumen rating than the two tach bulbs combined then the speedo would be noticeably brighter. I wanted a wide beam pattern because my hope was that this would spread the light out more evenly, trying to avoid a bright spot on the gauge. Judging from the pictures on their site, I was afraid the WLED-CW5 may be too large but it fit just fine. There are other choices for the speedometer LED bulb (and feel free to look around at what they have), but I am happy with my choices. Pictures of the final product are below as well and I think it turned out great! As is often the case with me, sometimes I over-think things. While you can remove the headlight to make this easier, I just used a special low profile ratcheting screwdriver (similar to this one from Amazon). This way I was able to get everything apart without too much extra fuss. Step 1: Remove the two Philips screws from the bottom side of the tachometer and speedometer housings. Step 2: Carefully separate the bottom housing section from the gauge by pulling. They may be a bit stuck together initially. You can also completely remove these gauges from the “stay”, but I was able to replace the bulbs with just enough access to the bulb sockets (see pics). Step 3: Pull the rubber bulb sockets out from the back of the tach and speedo housings. There are two on the tach and one on the speedo and all three will have green and brown wires coming out of them. They may be a bit difficult to pull out but they will come eventually. 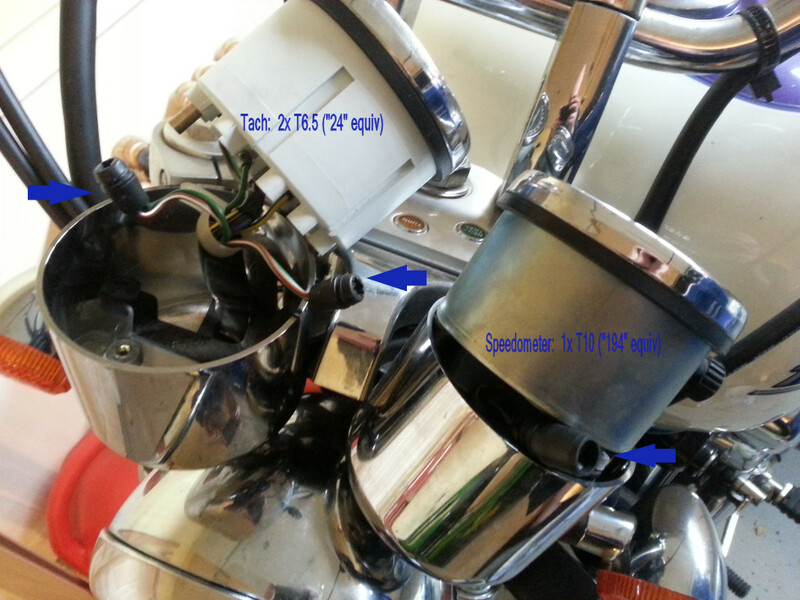 On the tach, you may need to remove the screw from the clip holding down the wiring harness in order to get the second bulb socket out. Step 4: Remove the original bulbs and install the LEDs. 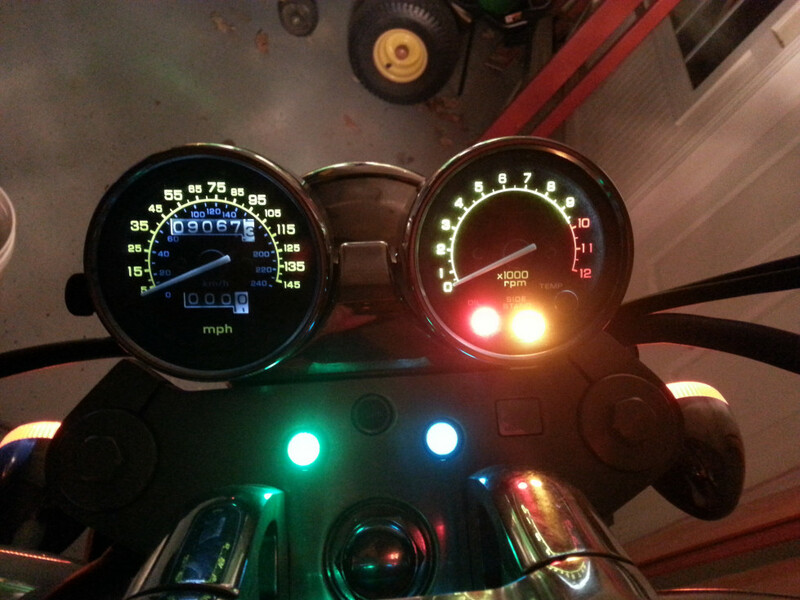 Step 5: Before putting everything back together, turn the ignition on and check the new lights! Unlike incandescent bulbs, LED bulbs are sensitive to POSITIVE and NEGATIVE voltage. Getting it backwards will not harm it, but it will not work. If any of the new LEDs do not light up, remove the bulb, rotate 180 degrees and try again. Step 6: Once you have confirmed that the new LED bulbs are all working, push the rubber bulb sockets firmly into the bottom of the gauge assemblies. Be sure they pop all the way in, as you don’t want them popping out later down the road. Then reassemble the gauge housings in the reverse order you took them apart. They can be a bit tricky to get back together and get the screw holes lined up at the bottom, but you’ll get it eventually. I was able to get to the bulb sockets without taking every thing apart completely but it was a bit tight on the speedometer. I hope this helped you out! If you have any questions or comments, please feel free to contact me.